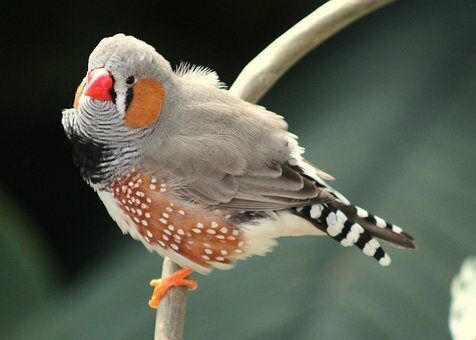 The Zebra Finch is also known as the Chestnut-eared Finch, the Shelley, as well as the Spotted-sided Finch. It’s not uncommon across Australia, and has become widely kept for both research and aviculture. On average, it’s about 3.9 inches long and weighs close to 17 g. The Zebra Finch has white and black tear-like stripes coming down beneath its eyes and reddish-brown ear patches on the sides of its head. Its upperparts are grayish-brown and its flanks are chestnut colored with white spots. There are thin white and black bars on its throat and the rump is white with a barred tail. The female does not have the reddish-brown ear patches, the stripes on the throat, or the seen chestnut colored flanks of the man. Juveniles are similar in appearance to the female, but have black bills rather than the orange bills found on adult males and females. The differences between the race, T.g. castanotis, and the other, T.g. guttata, are that the latter subspecies does not have the nice barring of the throat and are smaller in size. Due to its extensive distribution, the Zebra Finch can be found in various habitats. It prefers open country, such as grasslands and lightly timbered regions, but also occurs on the fringes of cities and towns. It is also common near farms. T.g. castanotis ranges across Australia, with the exception of western coastal regions and the island of Tasmania. T.g. guttata exists from Lombok in the Lesser Sunda Islands of Indonesia into Sermata and the coastal areas of Australia. The Zebra Finch has also been introduced to Puerto Rico, Portugal, and the United States. Its nests are found in many different areas, including cavities, scrubs, low trees, bushes, in termite hills, rabbit burrows, ledges of man-made structures, and even on the floor. The female lays an average clutch of 4 – 7 small white eggs. Both parents take responsibility for incubation, which lasts about 12 – 13 days. The young fledge approximately 18 – 21 days after hatching.